Footnote is a historic documents site which you can view some of the most exciting original source documents on internet. 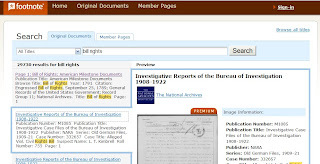 You can use its powerful tools to search and view images of original source documents, if you have original source images of your own that you want to share with your colleagues, classmates, friends and family, simply upload them to Footnote and use tools to make your images searchable and available to others. Footnote also gives you an opportunity to share your story, ideas or research with others by creating your own "Member Pages". You can join free member, if you want check all documents you need pay money.